World Equipment is a professional Chinese manufacturer and supplier of double drum vibrating roller (tandem vibratory roller). Our products have been well received by clients from Europe, South America, Middle East, Southeast Asia and Africa, and so on. Over the past 10 years, we have kept improving our products to make them better satisfy the market. We provide all kinds of tandem vibrating rollers, such as 3 Ton double drum vibrating roller, 4 Ton double drum vibrating roller, 6 Ton double drum vibrating roller, 8 Ton double drum vibrating roller..
Road roller belongs to road devices in the construction machinery. It is widely used for filling and compacting in huge construction projects such as roads, railways, airport runways, dams, stadiums. It can roll soil that has the texture of sand, semi-stickiness and stickiness, stabilize roadbeds and road surfaces of asphalt concrete. The invention of vibrating road roller is an epoch-making revolution in the development of road roller. From then on, the increase of the compaction effect does not simply depend on the increase of weight or linear pressure. The first self-operated road roller and tractor-towed vibrating roller appeared in the 1940s. In the 1950s, the vibrating roller with series integral frame was developed in Europe. Because of its good compaction effects, and large depths involved, high efficiency, and great adaptability to the filling and compacting of multiple materials, vibrating roller has become the standard device and the best choice in compaction operation. By the end of the 1960s, the sales of vibrating roller had made up 60% of the market share of road roller. 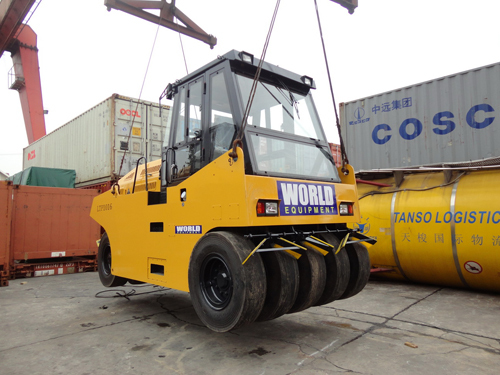 World Equipment provides the clients with single drum vibrating roller and double drum vibrating roller (vibrating tandem road roller). They feature hydraulic vibration, double amplitude, hydraulic steering, beautiful appearance, comfortable cabin, flexible steering, good stability, flat rolling, reliable quality and the optimal function/price ratio and reliable performance. Static roller functions with its own weight used in various compaction operations. It causes a permanent transformation of the layer compacted so as to closely knitted it. It can be divided into steel wheel static roller and tire wheel static roller. Three wheel static roller is used in compaction of roads made up of the materials such as ores, gravels, asphalt, concrete, non-stick soil, stick soil, limes and coal chars, square footing stones and road surfaces. We can provide the steering room and ceilings if the clients need them. 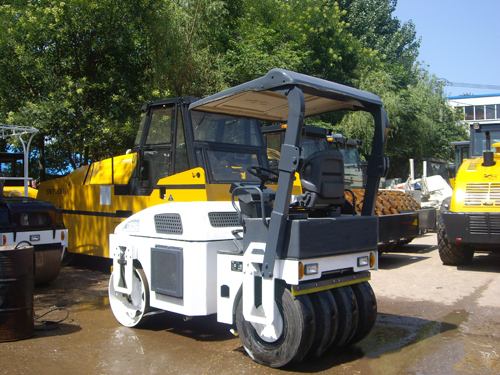 Our three wheel static roller has the advantages of low price, excellent capacity and stable operation. World Equipment is a professional manufacturer and supplier of road roller. We offer the clients single drum vibrating roller, double drum vibrating roller (vibrating tandem road roller), and three wheel static roller. In our over 10 years exporting experience, we have accumulated abundant clients and product experience. Our road roller has already been exported to Europe, South America, Middle East, Southeast Asia and Africa. We have clients in Congo, Tanzania, Russia, Algeria, Philippines, Kazakhstan, Iran, Saudi Arabia, Nigeria, Indonesia, Malaysia, The United Arab Emirates, South Africa, Australia, and Sudan.